Let us see now how they celebrated Pascha after the privilege of the three-day uninhibited celebration of it was abolished in the Queen City. A historical document of the Ecumenical Patriarchate of Constantinople, which was discovered many years ago in the Sacred Monastery of Sinai and dates to around 1772, reveals how the Turkish conquerors acted to smother the religious sentiment of the slaves during their great feasts and especially during the days of Pascha. In order to destroy the enthusiasm, consistency and hope that the traditional celebration of Pascha gave the slaves, they now put into practice decrees of oppression and exclusion which were issued from time to time and established how they should dress and how the Romans should celebrate these days. 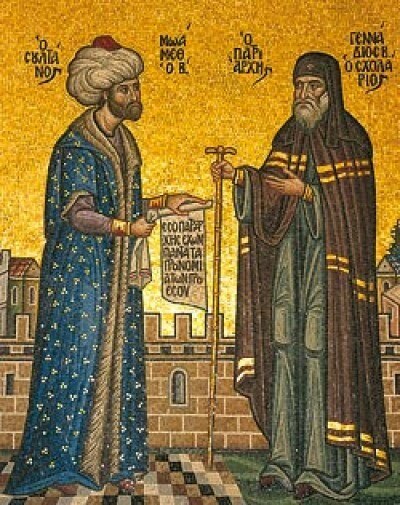 For Constantinople in particular, the administration of the Ottoman Porte invited the Ecumenical Patriarch and gave him strict orders and instructions for the celebration of Pascha by Orthodox Christians in Constantinople. They commanded the Patriarch to bring to his flock the orders of the Porte which stated that Christians, during the days of Pascha, should be dressed in poor clothing and not bright formal dress, nor beautiful and colorful outfits. These were only allowed for the tyrannical masters and were "prohibited dress" for the slaves. As is apparent from the patriarchal document of 1772, the mandates of the conqueror stated that Christians could not celebrate their Pascha, as in olden times, with their dances and their songs in the streets, but they were to celebrate with mournful silence, with "quietness and modesty", remaining in their homes and avoiding travel and visitations to their sacred shrines in the City. The Patriarch of Constantinople at that time (1772) was Theodosios II. It was to him that the Porte gave strict orders that Orthodox were not to celebrate Pascha with celebrations. Accompanying the decree was a stern warning of the dire consequences offenders would encounter. The Patriarch, seeing that the climate was hostile for Orthodox Christians and being well aware that the conquerors for even the most trivial reason could alter the great feast into a dire ordeal, acted as a good shepherd. He issued a document with instructions for the slaves to avoid being considered offenders.